Limited relevant discussion of supporting evidence of at least some merit, but in an inconsistent or unclear manner. Argues that the larger cooler will have a lesser rate of heat entering it per time, based on the mass of its conents. [10 points.] An ice sample (0.0° C) is placed onto a 5.00 kg aluminum block at 1.0° C. As a result, the entire ice sample melts to 0.0° C water. As this system reached a thermal equilibrium of 0.0° C, was heat transferred from the ice sample to the aluminum block, or from the aluminum block to the ice sample, or were both transfers simultaneously taking place? Explain your answer using the properties of heat, temperature, and thermal equilibrium. Correct. Heat transfers from warmer to cooler temperature objects. The aluminum temperature decreases, and thus is losing heat, while the ice melts (while its temperature remains constant), and thus is gaining heat. Discusses how each object loses or gains heat, such that the direction of the transfer is certain. As (p), but argument indirectly, weakly, or only by definition supports the statement to be proven, or has minor inconsistencies or loopholes. May confuse heat with internal energy (heat transfers due to a difference in energy rather than temperature). Nearly correct, but argument has conceptual errors, or is incomplete. Has heat flowing from aluminum to ice, but claims that internal energy of ice is unchanged (or Q_ice = 0) as its temperature remains constant. Limited relevant discussion of supporting evidence of at least some merit, but in an inconsistent or unclear manner. Has heat transferring from the ice to the aluminum, or has heat transferring from the aluminum causing the ice temperature to rise, or states that heat was transferred simultaneously from aluminum to ice and vice versa. 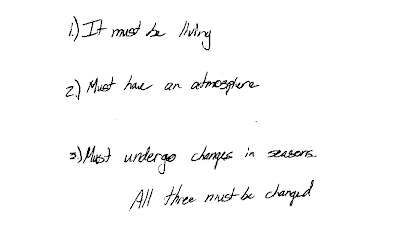 At least has some discussion of temperature gradient, temperature/phase changes, and/or internal energy changes. Implementation/application of ideas, but credit given for effort rather than merit. Statement of heat direction with little or substantive discussion. [10 points.] An aluminum cylinder at room temperature (25.0° C) is dropped into a hole in a block of ice at 0.0° C. As this system reached a thermal equilibrium of 0.0° C, was heat transferred from the ice block to the aluminum cylinder, or from the aluminum cylinder to the ice block, or were both transfers simultaneously taking place? Explain your answer using the properties of heat, temperature, and thermal equilibrium. 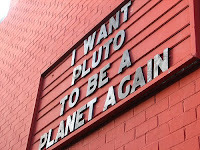 Astronomy final exam question: making Pluto a planet (again)? [20 points.] Write down the three qualifications established by the International Astronomical Union for a planet. Discuss how one or more of these qualifications should be changed/eliminated such that Pluto would again be considered a planet. (Photo credit: Untitled, Zara Evans, November 19, 2006, http://www.flickr.com/photos/zara/301724221/). Correct. Pluto already satisfies the first two IAU classification requirements (orbits the sun, and has spherical shape), but does not satisfy the third requirement, as Pluto does not clear/dominate its orbit. If this rule were eliminated, then Pluto would again become a planet. Nearly correct (explanation weak, unclear or only nearly complete); includes extraneous/tangential information; or has minor errors. Instead of eliminating the third IAU requirement, argues that Pluto should instead satisfy it if were to somehow clear/domintate its orbit. Contains right ideas, but discussion is unclear/incomplete or contains major errors. Problematic discussion, but at least understands IAU classification scheme. Limited relevant discussion of supporting evidence of at least some merit, but in an inconsistent or unclear manner. Only partial understanding of IAU requirements. Implementation/application of ideas, but credit given for effort rather than merit. Discussion of criteria unrelated to the IAU requirements. 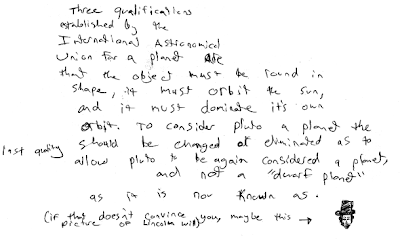 A sample "r" response (from student 7094), where it would be easier to change Pluto's orbit than to change the IAU rules? 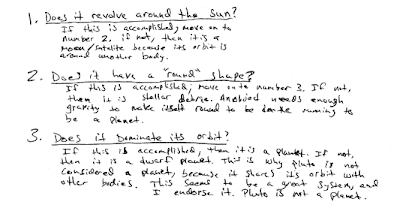 Astronomy final exam question: Pluto not a planet?. [20 points.] Discuss whether Venus' surface is older or newer than the surface of the moon, and the evidence that supports this claim. Explain by comparing surface features of Venus with the moon. Correct. The number of impact craters on much greater on the moon, indicating its crust is much older than Venus', which has much fewer impact craters, having covered over much of its crust with extensive lava flows. Contains right ideas, but discussion is unclear/incomplete or contains major errors. Recognizes importance of crater density, but may discuss how Venus' crust has more craters and thus is older, or correct choice for Venus' relative age, but crater discussion is problematic. Limited relevant discussion of supporting evidence of at least some merit, but in an inconsistent or unclear manner. At least recognizes that luminosity and temperature are relevant. May discuss Venus' atmosphere, runaway greenhouse effect, core, or other factors as evidence of its newer crust. 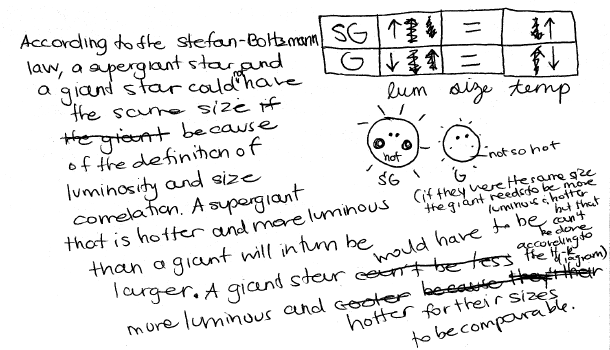 Discuss whether or not a supergiant star and a giant star could have the same size, and why. Support your answer using Wien's law and/or the Stefan-Boltzmann law. Correct. 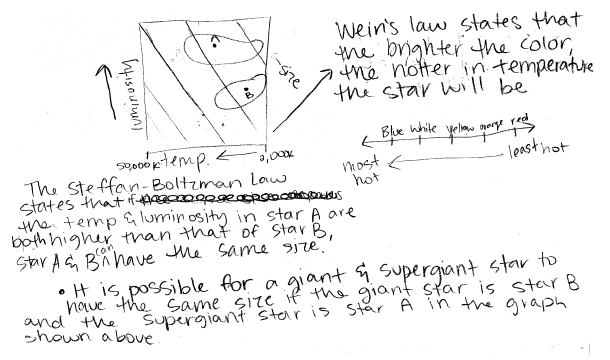 Discusses how the Stefan-Boltzmann law (luminosity is proportional to size × Temperature4) explains that two stars can have the same size if the more luminous star is hotter, and the less luminous star is cooler. Nearly correct (explanation weak, unclear or only nearly complete); includes extraneous/tangential information; or has minor errors. Applies the Stefan-Boltzmann law, but relative quantities between supergiants and giants are reversed (supergiants less luminous and cooler than giants), but still results in explaining their same size. Or may have correct Stefan-Boltzmann discussion, but does not believe in resulting conclusion of same-size supergiant and giant. Contains right ideas, but discussion is unclear/incomplete or contains major errors. 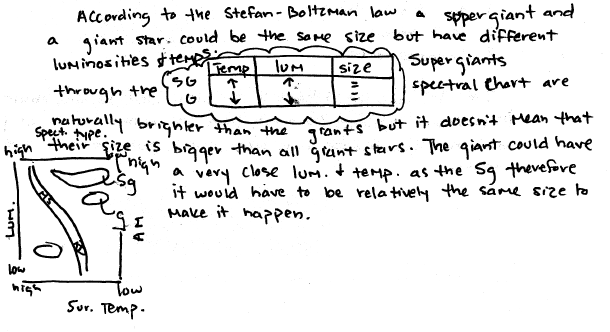 At least recognizes how the Stefan-Boltzmann law is applicable, but argument is garbled (e.g., has supergiant dimmer but hotter than giant of same size, or has size proportional to luminosity × Temperature). Limited relevant discussion of supporting evidence of at least some merit, but in an inconsistent or unclear manner. At least recognizes that luminosity and temperature are relevant. May give a plausible argument that a massive and medium-mass star could have the same size if they left the main sequence at different times to become supergiants and giants. 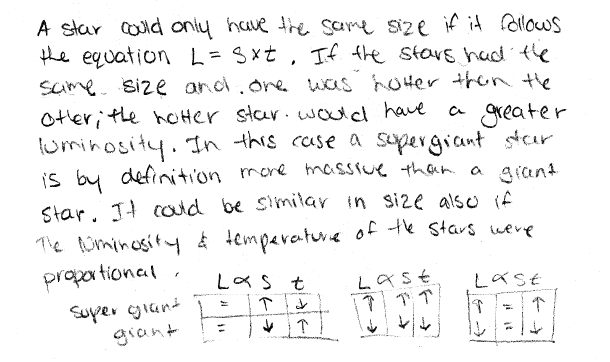 A sample "v" response (from student 5656), arguing that a same size supergiant and giant would have to have identical luminosities and temperatures, yet confuses stars with planets? Astronomy final exam question: water required for life? (A) transport nutrients and wastes. (C) start tectonic plate motion. It is plausible that any form of life would require the ready transport of materials to and from and within itself to regulate chemical processes, which would require a liquid (such as, but not necessarily exclusively water). 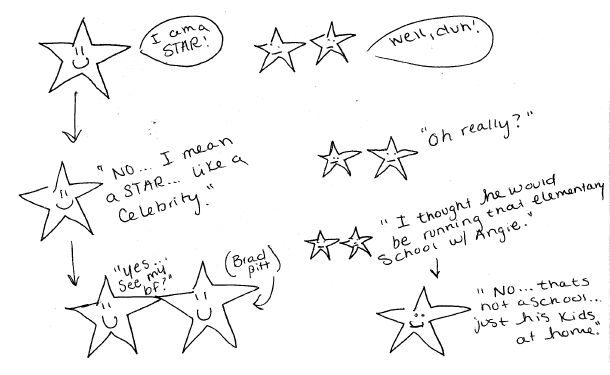 Astronomy final exam question: halo stars likely for life? (B) are not massive enough. (C) are not old enough. (D) have too much dark matter. Halo stars are the first generation of stars born in the Milky Way, and thus would be metal-poor, as well as their planets, which would then not have "metals" (any elements heavier than hydrogen, which would include carbon and oxygen). What time is it when the waxing gibbous moon is rising? (F) 3:00 AM (wee hours). Note that response (D) (9:00 PM) is the time that the waxing gibbous moon would be highest overhead. Which phase will the moon be in if it is setting at 9:00 PM? Clearly circle your answer below. Note that response (A) (waxing gibbous) is the phase that the moon would be in if it is highest overhead at 9:00 PM. (A) liquid nitrogen and methane geysers. (B) ammonia dissolved in the liquid mantle. (C) a highly inclined magnetic field. Atmospheric activity such as cyclones are caused by convection driven by the interior heat inside Jovian planets (i.e., The "Cream-in-Coffee Model"). Astronomy quiz question: volcanic terrestrial planet? A terrestrial planet __________ would be most likely to have active volcanoes today. (A) close to the sun. (C) with a low density crust. (D) with liquid metallic hydrogen. Massive planets are will cool off at a slower rate than less-massive planets, such that it will retain more core heat, and more likely to be volcanically active in the present-day (i.e., The "Turkey/Cornish Hen Effect"). What prevents Earth's atmosphere from building up too much carbon dioxide? Oceans absorb vast amounts of carbon dioxide, which settle into sedimentary rocks on ocean floors, which are then subsequently subducted back into the mantle. A 25 g iron sample at room temperature (25° C) is placed in 200 g of water at 80° C to reach thermal equilibrium. The specific heat of iron is 0.44 kJ/(kg·K). The specific heat of water is 4.19 kJ/(kg·K). The __________ had the greatest change in internal energy once thermal equilibrium is reached. (A) 25 g iron sample. (B) 200 g of water. As the two components of this system reach thermal equilibrium, the amount of heat given up by the 200 g of water is exactly equal to the amount of heat taken in by the 25 g iron sample. A 25 g iron sample and a 100 g iron sample are both at room temperature (25° C). The specific heat of iron is 0.44 kJ/(kg·K). When the 25 g iron sample and the 100 g iron sample are brought in contact with each other, heat is transferred from the __________ to the __________. (A) 25 g iron sample; 100 g iron sample. (B) 100 g iron sample; 25 g iron sample. Even though the 100 g iron sample has more internal energy than the 25 g iron sample, they are at the same temperature and thus will already be at thermal equilibrium when brought together in contact with each other, such that no heat will be exchanged between them. (A) cooler and lighter than a star, but heavier and warmer than a jovian planet. (B) an extremely old white dwarf. (C) an almost failed black hole. (D) theoretically composed of dark matter. (E) a star with a high proportion of dusty material. (A) a newly discovered ring system. (B) large mats of photosynthesizing algae. (C) erupting water vapor and dust geysers. (D) recent tectonic ice motion. (E) water circulating under sections of transparent ice. Students at both North County (Paso Robles) and San Luis Obispo campuses of Cuesta College (San Luis Obispo, CA) and the University of California at Davis were administered the Force Concept Inventory (Hestenes, Wells, and Swackhamer, 1992) during the last week of instruction, in order to follow up on the pre-test results from the first week of instruction (which showed no statistical difference between pre-test scores between NC and SLO campus students, and between these Cuesta students (pooled together into one population) and UC-Davis students). The post-test FCI results of NC and SLO campus students can be compared to each other. Note the higher mean score for NC campus students over SLO campus students; a "Student" t-test of the null hypothesis results in p = 0.0077, thus there is a highly significant difference between NC and SLO campuses of Cuesta College. A "Student" t-test of the null hypothesis results in p = 0.0017, thus there is a highly significant difference between NC campus and UC-Davis FCI post-test scores. A "Student" t-test of the null hypothesis results in p = 0.77, thus there is no significant difference between SLO campus and UC-Davis FCI post-test scores. This Hake gain for the SLO campus students is much lower than other think-(pair)-share courses at Cuesta College, but at least comparable to the radically restructured discussion/laboratory courses at UC-Davis, and conventional lecture-centric calculus-based introductory physics at Cuesta College. Cuesta College versus UC-Davis, Fall semester 2009 pre-tests. (A) counting solar neutrinos detected in Tokai and Kamioka at the same time. (B) shooting neutrinos underground from Tokai to a detector in Kamioka. (C) comparing neutrinos made in Tokai to identical twins made in Kamioka. (D) counting neutrinos that survive after being airlifted from Tokai to Kamioka. (E) shooting neutrinos from Tokai and Kamioka to collide in the upper atmosphere. Astronomy current events question: Eta Carinae supernova imminent? What observations by the Hubble Space Telescope Imaging Spectrograph indicate that the stars in the binary star system Eta Carinae may soon explode as type II supernovas? 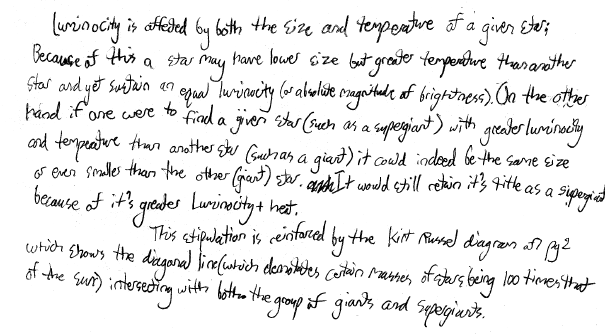 (A) Size of both stars have suddenly collapsed. (B) Size of both stars have increased, merging them together. (C) Increase in x-rays where their outflowing winds collide. (D) Neighboring star's supernova shockwave will soon hit Eta Carinae. (E) Orbits of both stars are spiraling even closer. (C) radioactive fallout from a thermonuclear detonation. What have University of Alberta researchers determined about the Cassiopeia A neutron star, using results from the Chandra X-ray Observatory? (A) Has a thin coating of carbon. (B) On the verge of imploding, becoming a black hole. (D) Transparent to certain types of x-rays. (E) Has not actually exploded yet, due to the finite speed of light. How do NASA engineers plan to free the Mars exploration rover Spirit from being stuck in sand? (A) Using its scoop to dig a trench out of the sand. (B) Waiting until the martian winter hardens the sand. (C) Carefully monitoring the results of spinning all wheels at the same time. (D) Pushing on a nearby boulder with its robotic arm to gain traction. (E) The exploration rover Opportunity will give it a push. 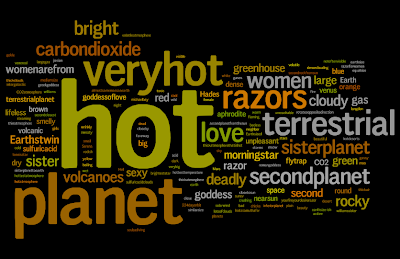 Wordle.net tag cloud for "Venus" generated by responses from Astronomy 210 students at Cuesta College, San Luis Obispo, CA (http://www.wordle.net/show/wrdl/1404478/Untitled). 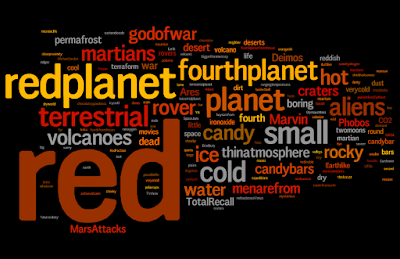 Wordle.net tag cloud for "Mars" generated by responses from Astronomy 210 students at Cuesta College, San Luis Obispo, CA (http://www.wordle.net/show/wrdl/1404592/Untitled). razors badass moo meow POW! red planet terrestrial colder water? [20 points.] A copper cylinder (density 8.92e+3 kg/m^3) weighs 12.5 N when suspended from a scale in air. 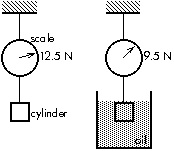 When this same cylinder is completely submerged in oil while suspended from a scale, the scale reading is 9.5 N. Find (a) the volume of the cylinder, and (b) the density of the oil. Show your work and explain your reasoning. Correct. Applies Newton's first law for the cylinder in air equating tension and weight to find mass, then finds volume V = m/rho_Cu = 1.4e-4 m^3. 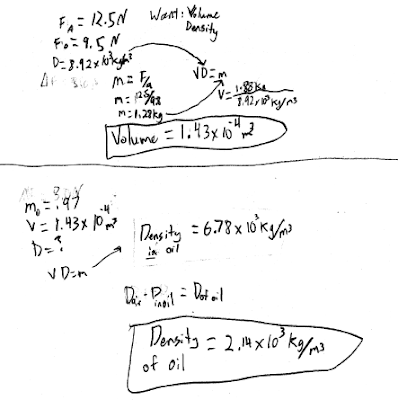 Applies Newton's first law for the cylinder in oil equating the upwards forces T = 9.5 N and F_B = rho_oil*g*V with the downwards weight (which is still 12.5 N), to solve for rho_oil = (w - T)/(g*V) = 2.1e+3 kg/m^3. Nearly correct, but approach has conceptual errors, and/or major/compounded math errors. Solves for volume using F_B = rho*g*V where F_B is 3.0 N, but rho is the density of water, or copper(!). Implementation of right ideas, but in an inconsistent, incomplete, or unorganized manner. 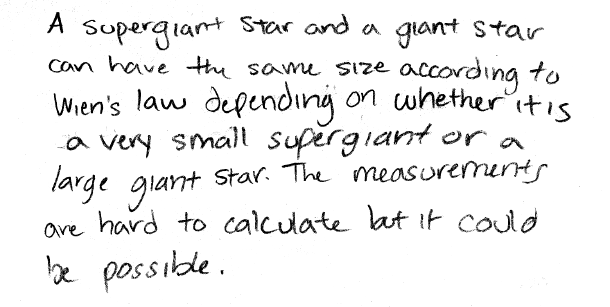 Applies specific gravity definition rho_object/rho_fluid = V_submerged/V_total to solve for the density of the oil and/or the cylinder volume, or uses P_2 = P_1 + rho*g*d.
Astronomy midterm question: supergiant seen as a main-sequence star? Discuss how it would be possible to observe a massive star during its main-sequence lifetime, while this star is actually a supergiant. 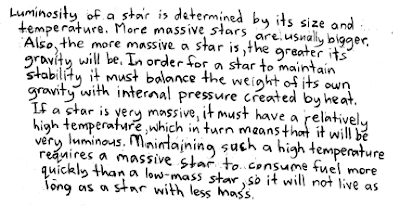 Explain using the properties of mass and stellar lifetimes, and light. Correct. Explains how the finite speed of light causes distant objects to appear as they did in the past, such that a massive star will still appear to be in its main-sequence lifetime, despite having already become a supergiant. Nearly correct (explanation weak, unclear or only nearly complete); includes extraneous/tangential information; or has minor errors. At least recognizes that distant objects appear as they do in their past, or that the vast distances and/or finite speed of light is relevant. Limited relevant discussion of supporting evidence of at least some merit, but in an inconsistent or unclear manner. Discussion based on short lifetimes, bright luminosities, and/or fast fusion rates of massive stars. "The mass of a star is the physical characteristic that, more than anything else, determines how the star will go through its life. Mass is destiny for a star." Discuss how the luminosity and the lifetime of a star are both related to its mass. 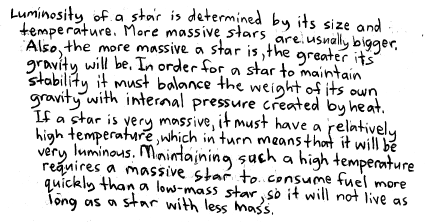 Explain using the properties of stars. Correct. 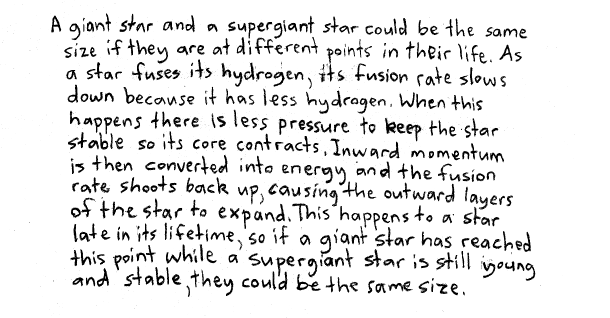 A massive star has greater gravitational forces that must be supported by greater internal pressures (hydrostatic equilibrium), which results in higher rates of fusion, and thus bright luminosities and shorter lifetimes. May motivate higher fusion rates and shorter lifetimes or massive stars due to the rate of energy released due to its bright luminosity. Contains right ideas, but discussion is unclear/incomplete or contains major errors. At least recognizes that luminosity, lifetime and mass are correlated to each other, but does not explicitly connect all three.